Ah, the Carribean. Sun, sea and, erm, dead bodies. Calling all Agatha Christie fans: this is a classic locked room mystery in which all the protagonists are gathered together at the end for the big reveal. Can the reader solve the mystery before the detective? Mmm, possibly. (I didn’t.) If not you’ll be sure to at least enjoy the drama as the pendulum swings from suspect to suspect. 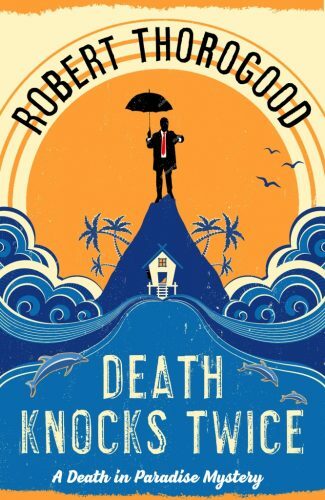 This is the third instalment in Robert Thorogood’s entertaining ‘Death in Paradise’ series. Well, it’s the third book anyway. I believe the TV series of the same name, which contains mostly the same characters, has completed three or four series of episodes now. The story begins when Lucy Beaumont, apparently a well-off young lady from a respectable family, reports a stalker to the police. As they follow her to the scene where her stalker was last spotted, shots are fired, and it won’t surprise readers when the stalker is found dead in a murder poorly disguised as a suicide. Gently amusing. Very British. Full of secrets and family dramas. Readers familiar to the series will be unsurprised to learn that DI Richard Poole still hates the tropics and persists in wearing his dark woollen suit, even when it nearly gives him sunstroke, because That Is What Detective Inspectors Wear. After all, as Richard grimly instructs his subordinate officer, Camille, if we don’t follow the rules, chaos will ensue. Of course, despite his best efforts to run a “normal” investigation, “chaos” of a kind is unavoidable. Richard feels constantly hampered by island life, whether that obstruction is caused by the islanders slightly lax approach to vehicle taxation, his boss’ insistence that he prioritise catching a rum bootlegger over investigating an actual murder, or the lack of crucial CCTV footage (caused by an iguana chewing through some computer wires). It’s life, but not as DI Richard Poole likes it. I really enjoyed this classic mystery story. Each of the Beaumont family has something to hide, of course, but who was the killer? How did they exit a room locked from the inside? And why did the victims have to die? It’s a tale of inheritance, madness and family friction peopled with very British upper class characters and their seemingly endless ability to dissimulate. I thoroughly enjoyed this mystery and found all the revealing of secrets intriguing. I always find the upper class attitude of, “well, you’re just a lowly policeman, you don’t need to know this really pertinent fact about my family because I’ve decided it’s not relevant,” really helps to keep DI Poole’s team working hard to understand motive, means and opportunity! 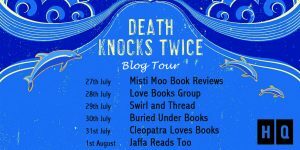 I was a little surprised that in a story called ‘Death knocks twice’ it took a good 250 pages before death did, indeed, knock twice, but this didn’t detract from the fun of the storytelling. I also really enjoyed the way all the threads were resolved by the end – and the Beaumont family unraveled! I continue to really enjoy the series and shall await book four with anticipation, assuming poor DI Richard Poole isn’t released back to the mainland anytime soon! You can find my earlier reviews on ‘The Killing of Polly Carter’ here and on ‘A Meditation on Murder’ here. Many thanks to the publishers for providing me with a copy if this book in exchange for an honest review.